Spotting a New York City taxi on the streets of Tokyo is an unlikely event, but that’s exactly what JapanCulture•NYC did last Sunday. The Nissan Gallery in Tokyo’s popular shopping district of Ginza had the Taxi of Tomorrow on display on its showroom floor. Visitors had the opportunity to sit inside the cab, watch a video, and listen to a presenter discuss the finer points of the vehicle, which was scheduled to hit the streets of Manhattan on October 28. The spacious interior has comfortable seating and plenty of legroom. Other amenities include USB ports and an electrical outlet for charging, but the best feature is that the floor is flat and doesn’t have a hump in the middle. 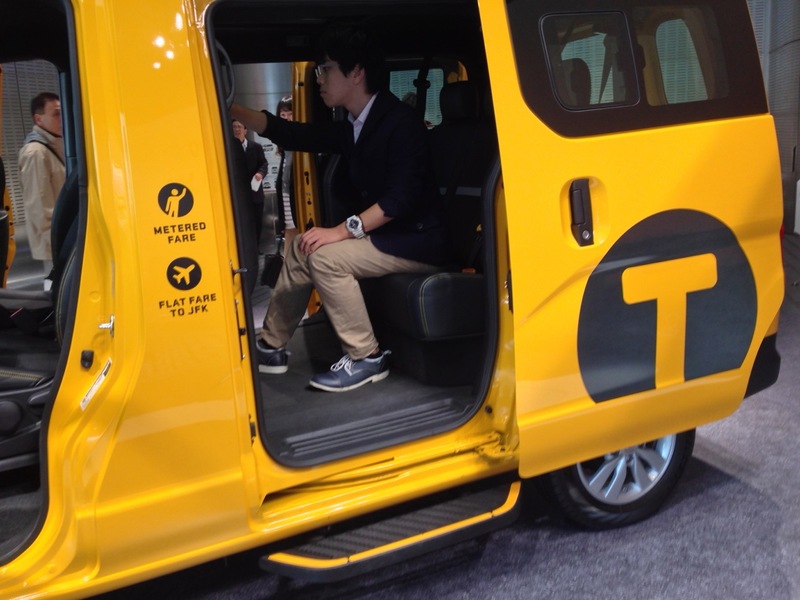 Clearly, Nissan is proud of the work they’ve done in preparing the NV200 for New York City, as you can see in this video we made of the Taxi of Tomorrow. Designated the “Taxi of Tomorrow” by the city of New York in a competition in May of 2011, the Nissan NV200 van was to replace the current hodgepodge of taxis over the course of the next decade, a contract estimated at approximately $1 billion, according to pickuptrucks.com. 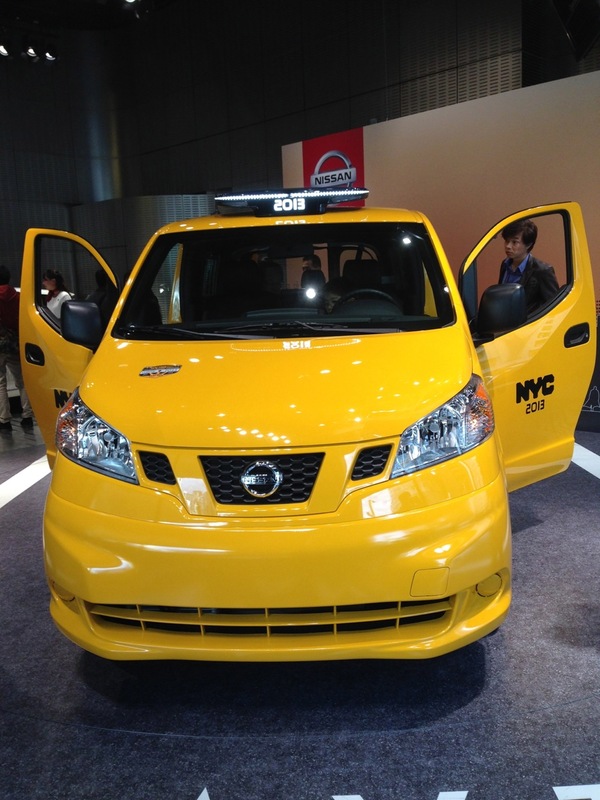 But the Nissan NV200 has hit a few roadblocks on its ride to become the exclusive fleet in New York. In early October, “Justice Shlomo S. Hagler of State Supreme Court in Manhattan said the city’s Taxi and Limousine Commission had exceeded its authority in devising a plan to require that nearly all yellow taxi operators purchase the same vehicle,” The New York Times reported. The Greater New York Taxi Association, a group of medallion owners, filed the suit. Another lawsuit, filed by people with disabilities and their advocates against the Taxi and Limousine Commission, argues that the entire fleet should be wheelchair accessible. (See more on that suit here.) The prototype that was unveiled in April of last year has been updated with new features, including a wheelchair ramp. 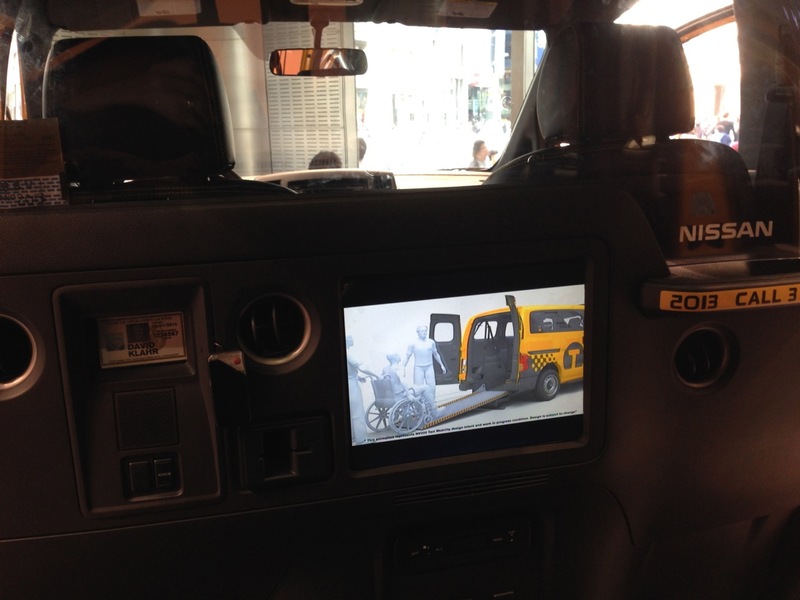 A video playing in the monitor inside the taxi shows a person in a wheelchair entering the back of the vehicle. Another argument against the NV200 is that it is not a hybrid. Nissan is reportedly working on an electric version of the model. According to CNN Money, being named the Taxi of Tomorrow actually has cost Nissan $50 million and has been a “very public embarrassment” for the Japanese car manufacturer. I don’t see this as an embarrassment for Nissan, but for the city of New York. The issue of giving an exclusive contract to one manufacturer, the environmental preferences, and the accessibility requirements should’ve been addressed before the Taxi for Tomorrow competition began. Instead, Mayor Michael Bloomberg awarded Nissan the exclusive contract without considering the potential firestorm it would cause. If Nissan is suffering a “very public embarrassment,” it doesn’t seem that way on Nissan’s website, and it didn’t show at the Nissan Gallery in Tokyo. 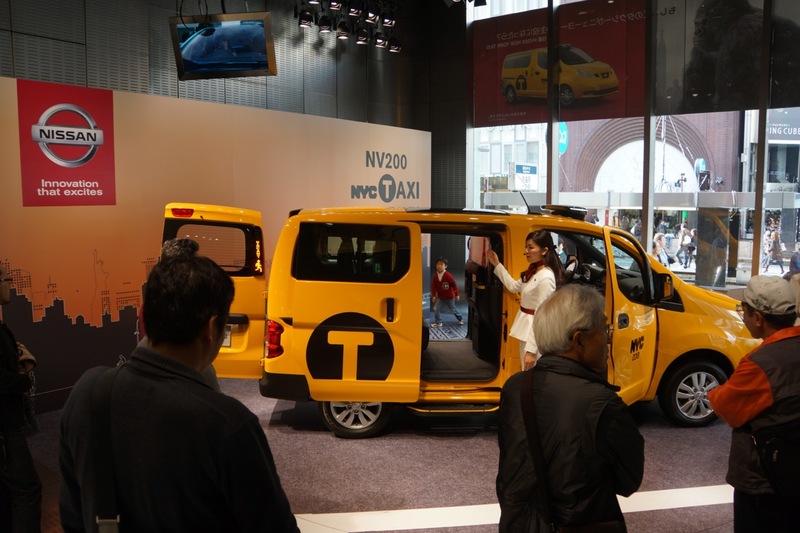 Despite the setbacks, the Taxi of Tomorrow was proudly displayed in the Ginza showroom, and at least a couple of the NV200s are available in New York, according to The Daily News. JapanCulture•NYC is looking forward to hailing the Taxi of Tomorrow in the near future. Previous Previous post: Final Winners in the Murakami Music/JapanCulture•NYC Trivia Contest!